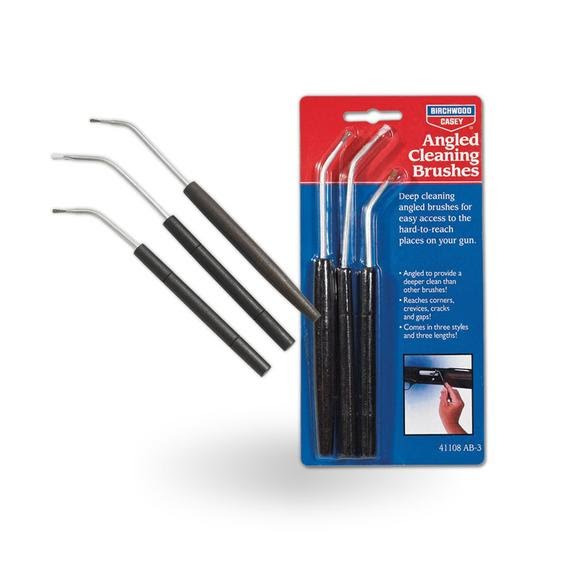 Birchwood Casey's angled cleaning brushes make deep cleaning easier! Three brushes with angled necks allow easy access to all the hard-to-reach places that can cause cleaning headaches. Straight-handled brushes simply can't reach where these brushes can. Three styles of bristles clean thoroughly and safely. Birchwood Casey &apos;s angled cleaning brushes make deep cleaning easier! Three brushes with angled necks allow easy access to all the hard-to-reach places that can cause cleaning headaches. Straight-handled brushes simply can&apos;t reach where these brushes can. Three styles of bristles clean thoroughly and safely. Use stainless steel bristles for hard metals and use nylon to avoid scratches on more sensitive surfaces. Comfortable and easy to handle, all three brushes have wooden handles that make gripping a cinch. Solvent and corrosion resistant.